The spots, on the star’s surface are the source of the gas-plasma mix radiation. Their occurrence increases the addendum Fiz in equality (5.1) since it increases the radiation weight. Simultaneously, a break of «an active zone» and the emission of part of the gas-plasma mix into the space reduce the addendum Fp since the pressure of the gas-plasma mix reduces as well. Reduction of the addendum Fp, reduces the emission speed, and the weight of the gas-plasma mix, through the dark spots on the star’s surface, which conducts to the reduction of addendum Fiz. How fact of emission of part of the gas-plasma mix, from an atmosphere of a star is expressed on the equality (5.1)? ΣFIz.k – the sum of the forces acting on compression, at the moment of emission of part of the gas-plasma mix, from the star’s atmosphere, through the «dark spots» on the star’s surface. vIz.k – the speed of k component of the gas-plasma mix which is being thrown out, through the «dark spots» on the star’s surface. Where Sk – the area of «the dark spot». Conditions of self-regulation by processes, occurring in a star», should exist for the thermodynamic balance, the nuclear balance and the power balance of the star. «The self-regulation by processes, occurring in a star», is important condition for star existence, which defines the borders of the possible stars sizes. At the increase of weight and sizes of stars, the parameters of the self-regulation are changing, which have influence on the period of life of the stars. With the excess of weight in which the action self-regulation is possible during the thermonuclear synthesis, there is no controllable nuclear explosion which does not lead to a formation of a new star, but leads to the emission of the matter collected in the form of stars from the epicenter of the explosion and to a birth of a galaxy. The self-regulation by the processes, occurring in a star defines also the lifetime of the star. When reaching the moment of self-regulation start, it becomes impossible to operate processes in the star, the star «dies» and transfers to the red giant stage. We have deduced the thermodynamic equation of star existence (5.21), but this equation is not enough for star existence. We shall try to define the conditions necessary for the existence of star that is already born. 1. 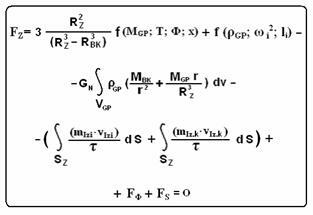 The condition of thermodynamic balance – the equation (5.21). 2. The condition of power balance. 3. The condition of nuclear balance. The equations of power and nuclear balances are necessary to deduce. 4. The condition of existence of self-regulation by the processes, occurring in the star.